The New York Opera Society (NYOS) benefits artists and audiences alike through high quality, performance-driven, just-in-time productions here and abroad, offering fresh and sometimes provocative interpretations of contemporary and classical works. In a world increasingly dominated by texts and tweets, a timely new opera offered a digital-age take on the time-honored tragic heroine. 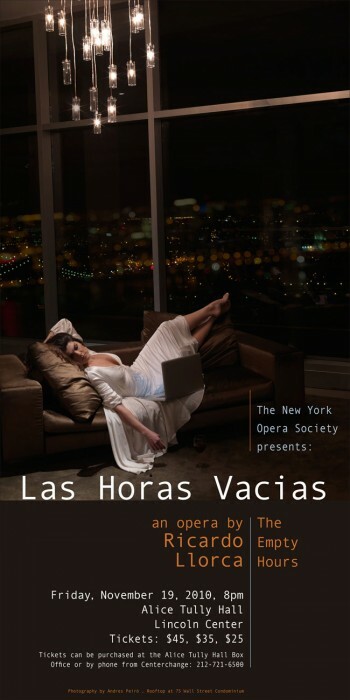 “The Empty Hours” (Las Horas Vacias) by acclaimed Spanish composer Ricardo Llorca had its staged world premiere at Lincoln Center’s Alice Tully Hall on November 19th. The tale of a lonely woman whose obsession with the internet fuels an extraordinary fantasy world, “The Empty Hours” was presented by the New York Opera Society in a special, one-night only performance. PKPR secured an in-depth feature on the opera in the Wall Street Journal (“The Music of Modern Mania”), and previews on WNET’s Sunday Arts, WNYC, and TheaterMania. We also leveraged the opera’s Internet theme to generate buzz in outlets like Time.com, Wired.com, Time Out New York, and Mediabistro.